Raizel, the couple's matchmaker shared the story- I have known Steven for over 10 years and and I met Galina about a year ago. They are both Russian speaking educated professionals. 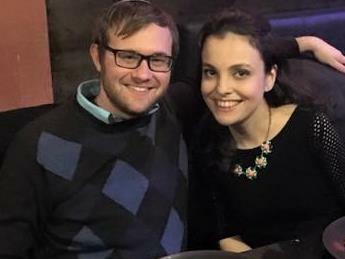 I was in a close touch with both of them throughout the duration of their courtship, both in person and through social media, hosting them for Shabbos, etc. I was also in contact with Steven's parents who became more observant and even kashered their kitchen to accommodate Steven and Galina. I met Galina's parents when Galina was in my area to pick out a wedding gown. They are both very happy about using SYAS. I was honored and humbled to be a part of their journey.